The pools were great and the sea pool was really good. We could snorkel in safety and we still got to see sea life :-). Within 30 min walk of Elounda which has a great night life and beach area. All inclusive is a great way to go on a holiday if you have kids or just want to relax and let someone else do all the work. The food everyday was varied and there was plenty of it. Staff were pleasant. Het ontbijt was redelijk. Lunch en diner deden wij buiten de deur. Jedzenie super, podobnie jak czystość w pokojach, baseny, darmowy masaż w cenie, dobra jakość internetu na WiFi w każdym miejscu hotelu I otoczenia. Miły personel, szampan na powitanie I piękny wystrój pokoju jak zobaczyli, że para. Codziennie sprzątane. Hotel posiada bardzo ładny bar przy jednym z basenów (o drugim barze przy drugim basenie pisze w minusach), gdzie wieczorem można się pobawić przy muzyce. Restauracja gdzie podawane są posiłki składa się z wewnętrznej I zewnętrznej części która ma widok na morze I półwysep Spinalonga(Kalydon). Bardzo duży wybór dodatków do jedzenia. Πολυ καλη εξυπηρετηση δωματιου υπεροχα γευματα αριστη συμπεριφορα ολου του προσωπικου . Πλουσιος μπουφες με ποικιλια στα εδεσματα για ολα τα γουστα και προτιμήσεις. Τα δωματια ειναι ανετα και για οικογενεια. 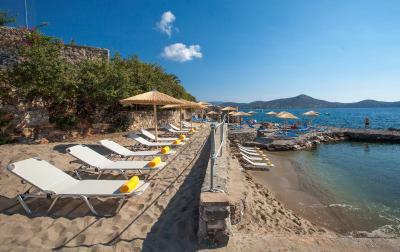 Elounda Breeze Resort This rating is a reflection of how the property compares to the industry standard when it comes to price, facilities and services available. It's based on a self-evaluation by the property. Use this rating to help choose your stay! 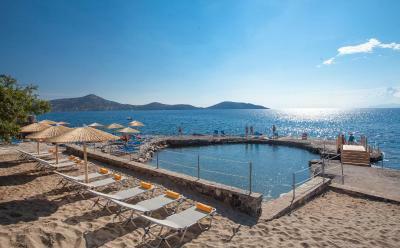 Featuring 2 swimming pools, Elounda Breeze Resort is 1.2 miles away from Elounda village. The 4-star resort is set 650 feet away form a private beach with water sports. Each of Elounda Breeze Resort rooms is fully air-conditioned and tastefully furnished. The spacious balconies open to relaxing views of the resort’s grounds and the sea. Families will love the family-fun pool, whilst those looking to unwind can take a dip in the relaxation pool. More active guests will enjoy the on-site fitness room with sauna, and the tennis and volleyball facilities. During the summer, Elounda Breeze Resort’s animation team provides live entertainment for the family, both day and night. 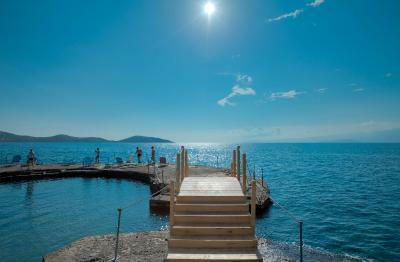 In the evening, you can enjoy Greek theme nights with live music and dancing. 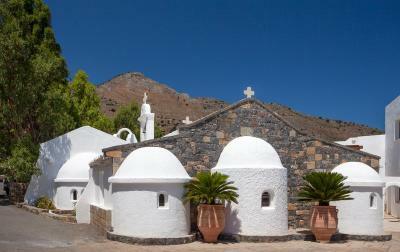 Elounda Breeze Resort is 5 miles from Agios Nikolaos. The airport of Heraklion is approximately 40.4 miles away. When would you like to stay at Elounda Breeze Resort? House Rules Elounda Breeze Resort takes special requests – add in the next step! Elounda Breeze Resort accepts these cards and reserves the right to temporarily hold an amount prior to arrival. Please note that full prepayment is required upon arrival. Car rental and room service are provided at extra charge. The food in the buffet that should've been hot was always tepid. It wasn't anything spectacular, the flavours were pretty lacking. Not all drinks are on the all inclusive. For instance, you can get draft beer, but not a bottle of beer. The bed was solid. Not very confortable, but so are most beds in Greece, so it's nothing unusual. The bathroom. Ugh. It was awkward. The shower was poorly set up, the head was facing out into the bathroom so you would flood the place any time you wanted a shower. So I decided to take a bath to get around that problem. Unfortunately when I went to let the bath drain, the plumbing must have been so poor that the water came flooding back up into the bathroom from the drain on the floor. We were on a budget, and really our stay there made us feel like we were REALLY on a budget. It was all a little tired and sad. Even the other guests didn't seem to be on much of a holiday buzz either. All inclusive isn't for us. We just don't enjoy eating in the same place and not exploring at all. The whole area was built on all inclusive so we didn't really enjoy any of it. Booking.com did not note that the resort catered only for French visitors. Although we could interact with staff they were only focused on the French tourists. All the entertainment was in French and we were told any excursions booked with the hotel would be in French. So if you don't speak French then your at a loss in the evening. We had to book our own tours when we could.